We're about to simulate some civic engineering and play Power Grid! Wait! Hold on, where are you going? Come back and let me explain! It really is more fun than it sounds. It includes Economics, Route Building and an Auction/bidding system. It uses some mechanics and turn order that make you use counter-intuitive strategies; strategies that don't seem like they should work and wouldn't work in other games. It's also been ranked in the top 5 board games on Board Game Geek since it was released. I'm just saying, you can't judge a game by its theme. I mean a game about monsters battling it out sounds awesome, but after 10 hours slaving away over a Titan board you'd be rethinking your first impression as well. Power Grid sounds like a grind, but it's an intense strategy and economics game that has kept me enthralled with every play. There are lots of dark cities on those maps and it's your job to get them power using Power Plants and Resources. This game will scale many features according to the number of players. For example in a 2 and 3 player game you will choose 3 adjacent regions to play on, differentiated by color and including 7 cities each. When playing 4-6 players you will use 4-6 regions- remembering that they all need to be adjacent. I'll show a summary of the additional game scaling at the end of this guide when you understand more of the game. This can seem a little clunky in your first few plays but after a couple games it starts to make sense why it is necessary. You start the game with 50 Elektro (this is what the currency is called). At the end of the game, whoever can power the most cities wins with money as the tiebreaker, but it's better to spend your money wisely so don't worry about the tiebreaker and hoard cash. You will use your Elektros to bid on Power Plants and buy resources to power them. This turn, yellow is first in the order. Red has 12 cities in its network and blue has 13. If you look at Savannah, you'll see it's divided into 3 sections- 10, 15 and 20. There are 3 steps during the game. During the first step you can only build on the 10 spots; 15 and 20 open up for building on the 3rd and 4th steps, respectively. You can see that Red has built a house in the 10 spot of Raleigh blocking yellow from building there until Step 2 when the 15 spot will open up. Note that you can only ever build in a city once; now that Red is in 10 spot in Raleigh, it won't be able to build on the 15 and 20 spots. To build in new cities they have to be connected to your networks through the pipes. If Red wants to expand into Savannah, he will need to connect from Atlanta or Raleigh. The cost to connect is on the Pipes. In this case, both routes cost 7, so there isn't much choice. For Red to build in Savannah, he will need to pay 17 total, 7 for the connection and 10 for the spot in the city. I want to point out that Yellow isn't blocked from building in Savannah. If it's Yellow's turn, he can connect from Washington or Pittsburgh simply by paying for all the connecting pipes. From Pitsburgh to Raleigh to Savannah there are 2 pipes at 7 each. So Yellow can pay 24 total to build in Savannah (7+7+10). That's a better option than Washington as the total to connect from there would be 5+3+7+10=25 Elektros. In step 2 the 15 spots will also open up, allowing Yellow to build in Norfolk and Raleigh for 15 Elktros instead of the 10 available in the first step. So that's how your network of Cities will be built during the game. In that picture Red and Yellow each control 6 cities. Now to power them! These are Oil Power Plants as noted by the Oil Barrels on the bottom. The number in the top left corner is the minimum starting bid while in the market. The number of barrels indicates how many barrels of oil you need to power it up. The number on the house is the number of cities you will power up when used. As you can tell the more expensive Power Plants are more efficient. These are Coal Power Plants, they use the same principals as the Oil. They just use, well, coal instead. In the early game, Coal will be more plentiful and cheaper than Oil, but becomes slightly more scarce (and therefor more expensive than Oil) in the later steps. I'll post a pic of the Resource table for each step after we've covered the Power Plants. These are Power Plants fueled by Garbage. Garbage is a little more rare as a resource in the beginning but it will build up as the game goes on (like real life). There are also less of these plants available in the deck so your competition for the resource may not be as bad if other players stay out of the Garbage market. The Power plants with the dual Oil/Coal icons are hybrids. They can be fueled by either Coal, oil or a combination of coal and oil. These give you a little more flexibility in the market. The Step 3 card, is a marker placed on the bottom of the stack. As the turns go by, the expensive cards will be removed from the market and placed on the bottom of the deck. When you get to the step 3 card, it moves you into step 3, so you can start building on the 15 spaces in the cities. The 50 Cost Power Plant Is The Fusion Fueled One; It Needs No Resources To Power Up To 6 Cities. If You Can Afford It Sooner Better Than Later, It Will Save You Elektros In Resources. These are the Uranium Power Plants. Uranium is a very expensive and rare resource at the beginning of the game. If no one else moves into Uranium early, it could pay off later in the game efficiently powering multiple cities for fewer resources. Like the Fusion Power Plants, these Eco-Power plants need no resources to power cities. They are more expensive and will be fought over in the auction, but will pay off in savings down the line. The top row of the Power Plants will be the Actual Market that you can bid on during the Auction. The Future Market will show what Plants will soon be coming into the Actual Market. If it's my turn to bid first, I can pick the 5 cost Hybrid plant and start the bidding at 5. The winner of the auction will take the 5 cost plant and replace it with the top card of the deck placing it in its ascending order. At the end of every full turn, the highest cost Power Plant (in the Future Market) will be placed on the bottom of the deck and a new one is drawn and placed in its ascending order. This will move the higher cost Plants to the bottom of the deck, ready for Step 3; pretty neat mechanic to sort out the too high-costed cards from the early game while keeping it all random. It's good to buy as much as you can for two reasons- the cheaper you can get the resources the better, and buying more before your opponents do means they will have to pay more. Which brings us to how the Resource market works. This is the Resource Market on the board. The picture shows you what each little wooden piece represents. Each square has a little gold coin with a number. If you need to buy coal right now, there are 2 available for 4 Elektro each and 3 available for 5 Elektro each. The most Expensive resource right now is Uranium, with only two available at 14 and 15 Elektros. The picture shown, shows the Market just after 10 coal, 2 Oil and 1 garbage was purchased. If you put those back, that represents what the game starts with. You can see Coal is cheap and plentiful when the game starts. Let's just concentrate on the 4 Player chart to get an idea. You can see that during Step 1 five coal is added at the end of each turn, with Oil, Garbage and Uranium only getting 3, 2 and 1 respectively. But by Step 3 these numbers change up a little bit. Coal becomes more plentiful in Step 2, but really falls off in Step 3. Oil and Garbage become a little more plentiful over time, while Uranium gets a little more love in Step 2, but stays plateaued in Step 3. These are importanat numbers to watch and compare with the competition for them. If 3 players in a 4 player game are fighting over coal, it will be very expensive and rare. It's almost like you're learning about economics! But it's fun! Trust me! Let's get to playing now that you know a little bit about the game. The first order of business every turn is to determine the player order. For the very first turn, this is chosen randomly; just place the houses on the Player Order track at random (I shake them all in my closed hands and open them just enough to let one drop at a time, but you can use any method to randomize them). 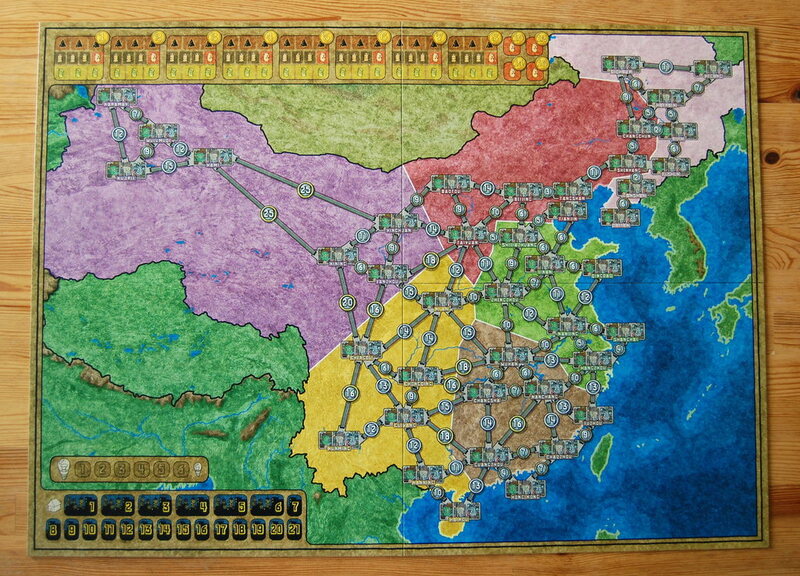 After the first turn, the order is determined by the number of Cities in each players network (houses on the board). The player with the most is first; if there is a tie than the player with the highest costing Power Plant in front of them is placed higher. Next you may bid on and buy a Power Plant from the Actual Market. The first player to pick one to bid on is the player first on the player order. You may pass on picking a power plant to bid on, but if you do you are locked out of the entire phase and you won't be able to bid on any following auctions. If player 1 chooses to bid, they will pick a plant, move it up and bid the minimum on the card or higher if they choose. The next player to bid follows the player order, they can either name a higher bid, or Pass. If a player passes on the current round of bidding they may not renter the current auction (but they can still participate in the next auction). When you buy a power plant in this Phase you can not bid on any more for the turn. When a Plant is purchased from the Actual Market, a new card is drawn from the deck and the order of the cards in the future and actual markets are rearranged in ascending order with 4 in each market. Here is where some of the interesting strategy I talked about earlier comes in. Going last in the Auction gives you a bit of an advantage as you can control how much someone pays for a plant by being the last to bid. You will also get to choose your starting card last, and becasue Plants are placed in ascending order, you will get the latest and more efficient plants to bid on. You will also have less competition bidding on them, especially if you are last, then you have no competition at all and can purchase a plant at the smallest possible bid. Now it's time to buy Resources to power your plants with. Again the player lowest in the turn order gets an advantage, because they get to buy first and the first player gets to buy last. You've seen the resource market above, so you should note that being the first to buy means you will get your resources at the lowest costs. You can only buy what you can store, though, but like I said earlier, it's good to buy to full capacity making your opponents pay more. You're free to move resources around at any time, for example, if you have 3 Plants and you upgrade to a better one you can move the resources from your discarded one to a new one. The last player in the player order will go first again. This is where you can add cities to your network buy placing your houses on open spots as I described earlier when I showed you the map. Remember, you have to pay all connection fees to connect to houses you already have on the board. For the first turn, you simply pick a city to start in by paying 10 and placing a house there. You can build as many houses as you can afford; remember that you don't need to power them all if you don't want to. So if you powered 3 houses you will earn 44 Elektros to spend next turn (or hoard for later turns). After everyone has earned cash, you will refill the resource market according to the Player Number/Resource table I showed you above. You will also remove the highest cost Power Plant from the Future market and place it on the bottom of the deck, replacing it with one from the top of the deck. You will repeat these turns until the end game is triggered. As you play, the different Steps are also triggered. You start in Step 1 and play as I've described with only the 10 spots open on each City. Step 2 starts before Phase 5 after any player builds their 7th city during Phase 4. You'll remove the lowest cost Power plant from the game, replacing with one from the top of the deck (rearranging again in ascending order). Also the 15 cost spots are now available in the cities and the resupply numbers from the resource chart will change. Step 3 is triggered when the Step 3 card is revealed from the Power Plant deck. The Power Plant market is condensed to just 6 cards and all 6 are now available to be bid on during Phase 2. The 20 Cost spots are all now open as well. 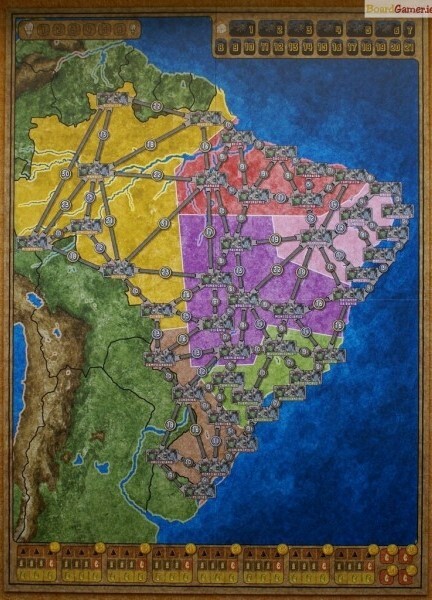 The game ends immediately after Phase 4 when at least one player has at least 17 cities in their network. No more resources and no more Power Plants can be purchased. The winner is the player who can power the most Cities in Phase 5, with remaining money as the tie breaker. Back to the counter-intuitive strategy of the game; you never want to be leading the pack during the game becasue san-bagging will give you better positioning in the Power Plant Auctions, resource buying phase and city connection phases. If you can hang back and build up your money to make a ton of new connections and trigger the end game when you are in a position to power the most cities you will win. This isn't the only way to win, but it makes games interesting when everyone figures this out and you need to start looking at new ways compete. Power Grid, like any successful game has expansions, I've been completely content with the two maps of the base game myself, but here's a little bit of info about what's available in the U.S from Rio Grande Games. (There are many more available in the European and German markets) These expansions all need the pieces and cards from the base game. This expansion includes a board with those two countries and some slight rules updates to reflect the power culture of those countries. France has embraced Nuclear Power, so the deck order will give you an earlier start with Unranim Plants and more Uranium available earlier and cheaper. Italy has more garbage to use, but less natural coal and oil resources. 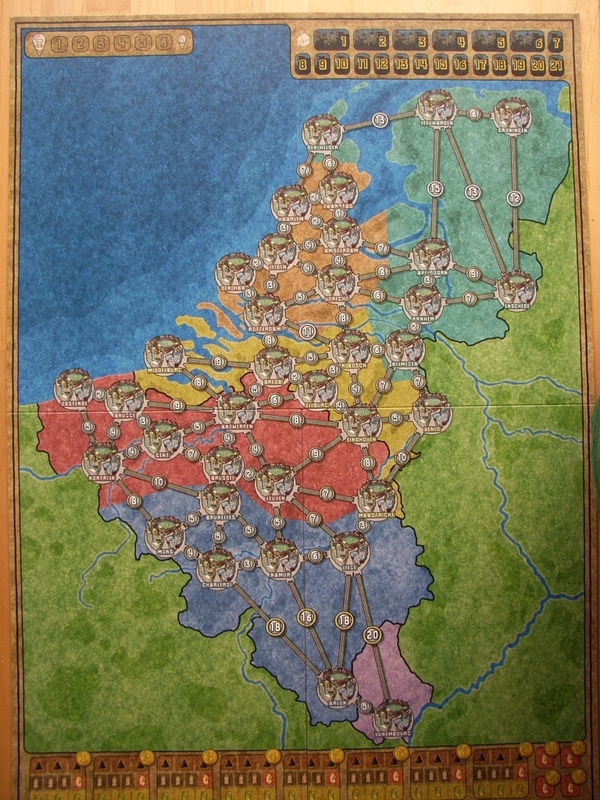 Benelux map and rules will have rules that give you quicker access to Eco-Power and More Oil than Coal. 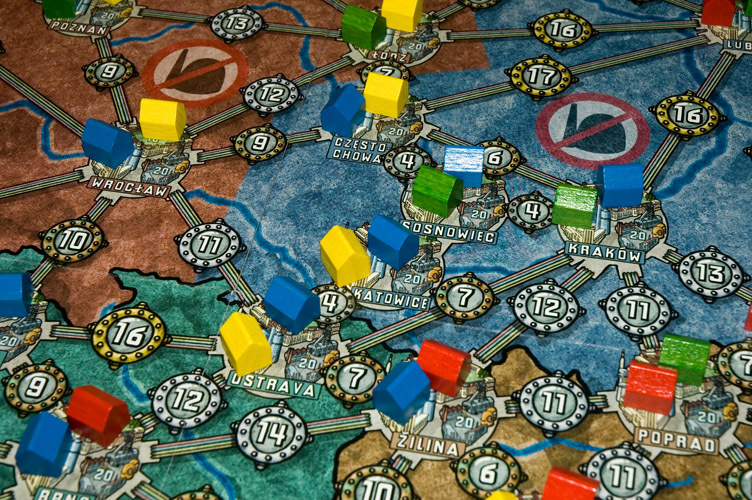 For the Central Europe Map, Poland will provide a lot of coal while restrictions on Nuclear power will be greater. The Market for Power Plants is restricted in Russia as well as the rules for exchanging out old Power Plants. 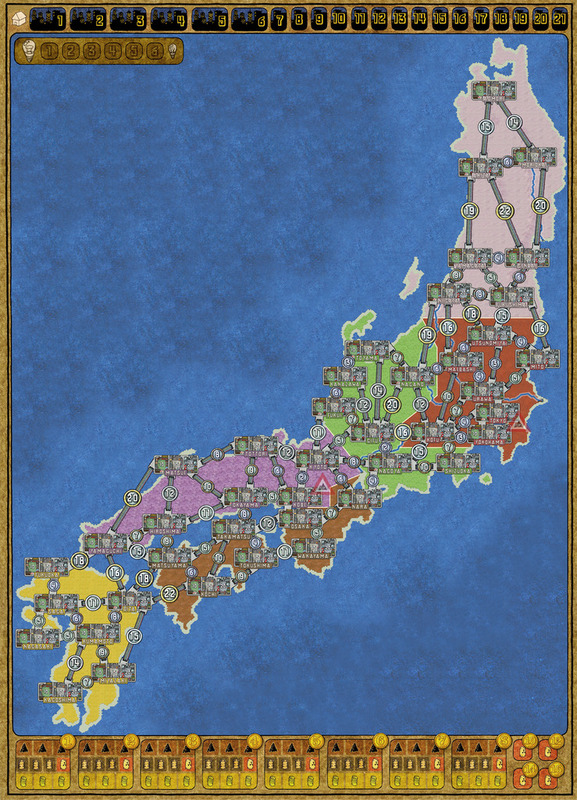 In Japan, the crowded geographical surroundings call for the ability for players to start two separate networks, but the first connections are restricted to certain cities forcing more conflict. Brazil prefers Biogas for electricty production, so the Garbage and Garbage plants are considered Biogas for this map. Resources are more scarce all around, and the market for them is intense. In Spain and Portugal the Uranium market is twisted- there will be none in Step 1, but the supply will be flooded in Step 2. At the same time, 3 large Eco Power Plants are removed from the deck making resources even more important. 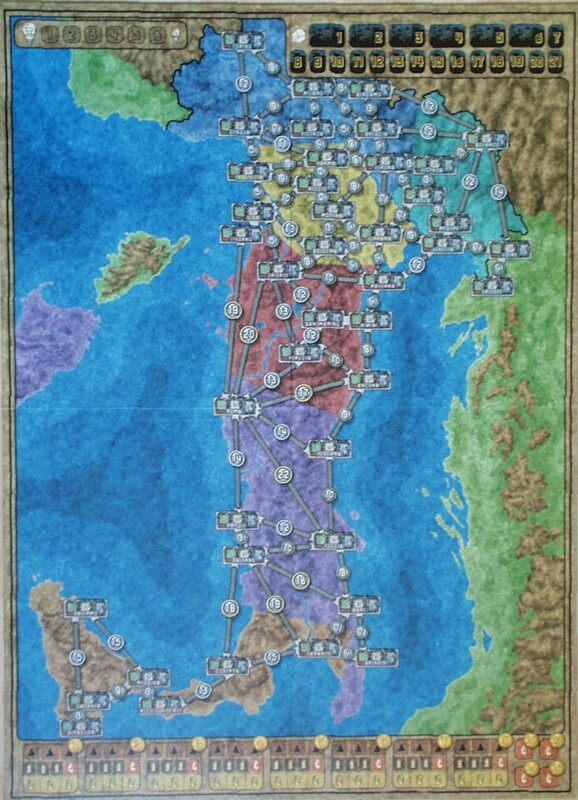 The Korean Map is split with two separate resource markets, North and South. China has a very strict and planned economy, so the Power Plants will come out in ascending order for Steps 1 and 2. There is a completely new Power Plant deck available that can replace the old deck to change up your play for any map. Or you can pick and choose to build your own custom or random deck to play with using both decks. 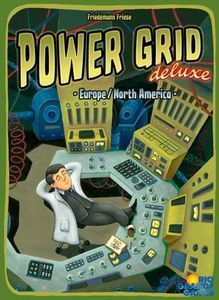 Friedemann Friese has also expanded the Power Grid franchise with standalone games that have a similar feel but are completely different. 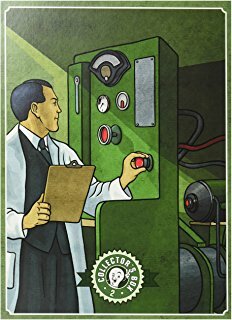 I really Enjoy Power Grid: Factory Manager, as it feels like a little bit tighter of a game. (yes, managing a factory sounds boring, but again, trust me! It's fun and you get to run Robots!) He also has Power Grid: the First Sparks coming out soon which brings you back to the stone age for some early life economics in hunting, gathering and growing your tribe's reach. It's supposed to be much faster paced and more direct than the original Power Grid. I'm excited to try it out.